Agilent Technologies have released a major upgrade to the firmware for their Agilent N6705A DC power analyser. This release incorporates many new and improved features based on customer feedback that increase capabilities and improve ease of use. It is shipping with all new orders and is a free upgrade for all existing customers. The Agilent N6705A DC power analyser provides unrivaled productivity gains when sourcing and measuring DC voltage and current into a DUT. This tool, which research and development engineers can use to gain insights into the DUT's power consumption in minutes without writing a single line of code, represents an entirely new instrument category for research and development engineers. 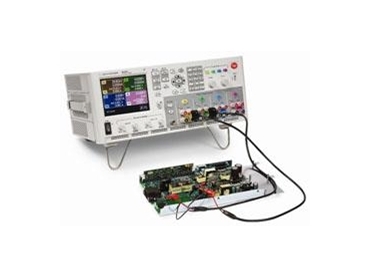 The Agilent N6705A DC power analyser is a mainframe that can combine up to four DC power supply modules with advanced features. All 22 DC power modules available for the N6705A have built-in digitisers that can measure voltage, current and power, and display these measurements like a DMM or oscilloscope. They also contain power arbitrary waveform generators for creating voltage or current waveforms, and a data logger for taking measurements over a long period of time. It also provides an easy-to-use interface, with all sourcing and measuring functions available from the front panel. The Agilent N6705A DC power analyser is ready to accept from one to four DC power modules, totalling up to 600W. For customers in the defence industry who are concerned about USB security, the Agilent N6705A DC power analyser has an option to remove the USB interface.